Have you tried turning it off and on again? It actually works and we can thank the I.T crowd for bringing this phrase to the attention of so many. I guarantee every one of you, when you have called I.T support, either at work or for your home Internet would have heard those words and then rolled your eyes. So….Why does restarting works so well? You open programs, then you close programs. Perhaps you install or or remove software or applications. Your Internet browser could be open for hours, or even days, at a time. Lots of other things stop and start as well – things that you never see for yourself. Can you visualise how much is going on in the background that you are not aware of yet? We use our computers a lot, especially over the course of several days or more. What you might not realize is that a lot of what you and your operating systems does is leave a footprint, usually in the form of background processes, that you don’t really need running anymore, or programs that didn’t quite close all the way. All of these “leftovers” can hog your resources – particularly the RAM and hard disk. So when too much has gone on – then problems start to appear: Slow system, programs that won’t open anymore, error messages… you know the sort of thing. When you reboot your computer, every single program and process ends as the power leaves your computer during the restart process. Once your computer starts back up, you have a clean slate of sorts again and, more often than not, a faster, better working computer – and more often than not, the issue you were facing has resolved itself. This same logic applies to other devices that you don’t call a computer, but in reality actually are. Devices like your TV, smartphone, router, DVD, digital camera, (etc) all have tiny operating systems and software that run into the same issues that your full blown PC sometimes does. Rebooting those devices is usually as easy as removing power for several seconds and then returning it. In other words: unplug it and then plug it back in. 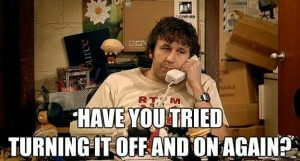 So, the next time you need to call your I.T support because your computer is having issues ask yourself. Have you tried turning it off and on again? As you could solve the issue yourself – trust me the techie doesn’t want to ask the question either, they hate having to do it too – but it really is not as “daft” as it sounds and can often save a lot of time troubleshooting an issue a restart solves.